This is a continuation on my analysis of the probabilities of an American ‘civil war‘ developing within the next 5-10 years. In the last post, I pegged it at a pretty low number. People who know me might have thought I believed it would be higher. A lot has to do with what we mean by ‘civil war.’ If we’re thinking of something like the first American civil war or something like the present Syrian conflict, the odds are very low. If you ask me what my estimate of probabilities of a ‘black swan‘ event occurring in the next 5-10 years, I would put that at well above 50%. As for an actual ‘civil war,’ I argued that the neutrality of the US military and its loyalty to the US Constitution was a very strong counterweight against that eventuality. Another counterweight is the subject of this post. In the previous post, I left the reader to ponder this 2016 map of the US presidential election, by county. A great deal has been said by many people about this. I could spill a whole book on it, myself. This image provides a ‘quick look’ explanation for why the nation is divided. Almost all of those blue spots are just cities. If we could zero this in by voting precinct, it jumps out even more. Think its just 2016? It jumps out even if you look at 2008, when Obama won. No, there is a genuine divide. It does not merely fall along ideological grounds. A big part of it is a function of the setting in which people live and breathe. 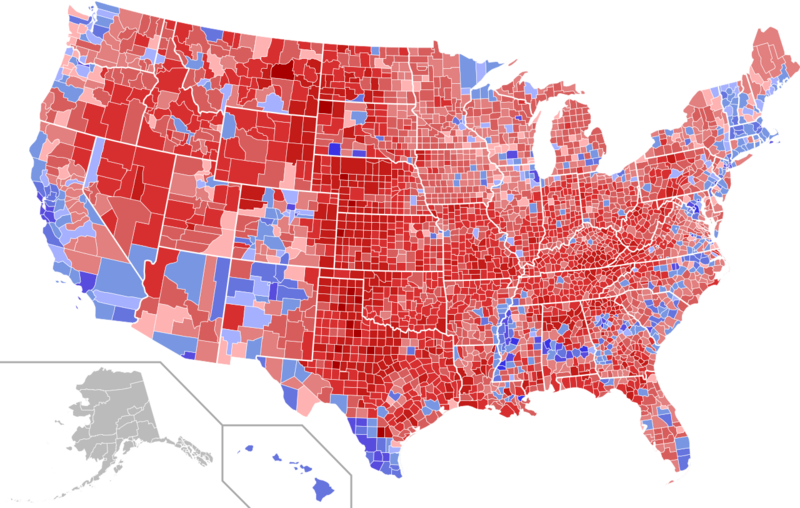 Even Democrats who live in ‘red’ areas tend to be more ‘conservative’ than Democrats on the Left Coasts. The converse is also true. Understanding how this fuels division in our country is not too hard to understand, especially when you ponder it through my series on ‘good’ and ‘bad’ liberals and ‘what went wrong with the left.’ People in the cities, liberals and Democrats in general, and progressives in particular, have outright disdain for anyone who does NOT share their values–no matter where they live. They want a particular way of life, which they also believe is morally superior to everyone else’s, and ‘city life’ carries that romance. But, others do not want that particular way of life. Thus, they don’t live in the city. Duh. Neither ‘group’ wants to live like the other and tend to have entirely different values altogether. So, are they basically the same? No. 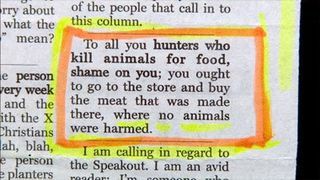 The people in the ‘country’ just want to be left alone. The people in the ‘city’ get a shiver down their leg at the thought of ‘helping’ people–at all costs. The ‘city’ folks have a value system which compels them to impose their values on others. The ‘country’ folks have a value system which compels them to mind their own business. When your two biggest states are each openly talking about secession, you know you’ve got a problem. But California wants to secede because they are mad that the rest of the country won’t do everything they want them to do. Texas wants to secede because California is trying to make Texas do what California wants. Thus, the two positions are categorically different. They aren’t really the inverse at all. So, if New York wants to have socialized health care, let them. But don’t make Texas participate. If California wants to tax themselves into oblivion, let them. But don’t make people in Wisconsin have to do the same thing. The 10th amendment is probably the greatest barrier to a bloody civil war that we have on the books. Its also an empty suit. It has been completely disregarded. The result is that it becomes impossible to vote with one’s feet. That means that people become trapped in a corner. People share with animals the ‘flight or fight’ instinct. Rather than battle it out, they would rather move. But if you do not give them anywhere to move to, that only leaves one option. One of the genius aspects of the United States, as founded, was its willingness to let individual states do just about anything that they wanted to do. If people didn’t like what their state was doing, and there seemed to be no hope to change it, they could move. Obviously, the slavery issue complicated this. But the baby got thrown out with the bath water. (I actually don’t believe the slavery issue was resolved correctly in the American civil war.) It is often said, rather snidely, that the Civil War put paid to the 10th amendment. It showed, according to these people, that the Federal government could, and should, intervene in the affairs of the states. Can you really sit by in Ohio while there are slaves in Arkansas? It is a shallow question, exhibiting no critical thinking, whatsoever. There are still slave states in the world, even today. For example, in Mauritania. Never heard of that country? Oh, but I thought you cared about slavery? Throw in regimes like North Korea, and its clear that we all manage to sleep just well at night, even knowing that there is extreme injustice in the world. Few are advocating the invasion of Mauritania. One could argue that North Koreans are basically slaves, but we manage to tolerate that regime. If Hitler had contented himself with murdering only the Jews in Germany, he probably would have been left to do so. We have the globe’s silence in the face of atrocities in Rwanda in the 90s as evidence for that. Or even its embarrassed acquiescence to the subjection of the Rohingya. Oh, and China is actually putting Muslims in concentration camps… RIGHT NOW. And from the morally pure and righteous knights on white horses that populate our cities? Crickets. You mention “State’s rights” to them and they shout, “SLAVERY!” But if that’s the standard, then their silence in the face of continued slavery tells us just how little they consider that standard. The countryside is the last place in America that people can go to be free from the groping hands of intrusive do-gooders, but the do-gooders won’t take the hint. With no where else to go, those in the country have the ‘flight’ option removed from them. Talk about a recipe for a disaster! Here is a quick example: the food in the city comes from the country. I know, I know. You thought it came from the super market! Since the divide in this country is not ‘north vs south’ but rather along rough ideological grounds which are diffused throughout the country, and are most clearly visible when comparing rural values against city values, it would follow that if things came to a boiling point, it would do so where city boundaries fade away and rural life begins. If push comes to shove, the people in the country are going to be able to survive just fine. After a couple of weeks, the city folks, who have been relying on ‘just in time’ delivery systems, are going to start feeling it. And if this is all going down because of animosity between ‘city’ vs. ‘rural,’ you can sure as heck bet that the ‘rural’ folks aren’t going to be letting any of their food head into the cities. The city folk will be able to extend things a little longer by having food flown in and via other contrivances, but in any serious altercation, we would do well to remember what I said in the previous post about the number of guns in America, and who owns them. This sentiment exists because people in one area–cities, usually–think it is entirely appropriate to tell people in another area–the countryside, typically–what they can and can’t do, and oh, by the way, they’re going to pay for it, too. Eventually, the ‘city’ folk are going to push too hard, and we really will see states partitioned into additional states. Or, I should say, they had better let them. If people are denied the right to self-government, and they are denied the right to vote with their feet, then things are really going to start coming to a head. And when it does, you will see that the rural folks will prevail. They have the food. They have the natural resources. They have the guns. They don’t need the city folks. The city folks desperately need the rural folks. When push comes to shove, my belief is that the city folks will cave to the demands of the country folk–demands that amount to basically to be left alone. Pragmatically speaking, just as civil wars don’t typically happen unless the military picks a side, the rural folk tend to prevail in conflicts against city folk. In the case of America, these dynamics are going to serve to prevent such a conflict from occurring altogether. However… and this is important… this is only the case while it remains possible for people to ‘vote with their feet.’ For example, eg, if high taxes in New York force people to go to Florida, and then Democrats then tax the entire nation, Florida included, the way that people are taxed in New York, that will leave people with no where to go. They will be backed into a corner, and eventually, they will lash out. The very best way to curtail this eventuality is for the city folk to start minding their own business. If the government in Chicago wants to provide innumerable services, let them. But do not view the people in Peoria as the piggy bank for Chicago to draw from endlessly. Similarly, it is absurd that the people in Washington DC can adequately represent the interests of people in Billings, Montana, except in very limited affairs. The framers of the Constitution understood this, which is why the citizens of Montana were going to be governed primarily by their fellow residents of Montana. Let Montana govern Montana. Let Peoria govern Peoria. Let the cities govern the cities, and the rural folk govern the rural folk. Self-government all around, if you please! Why the good citizens of New York City and Las Angeles believe that it is a good idea to fund their massive appetites for big government by sucking people dry who live, literally, a thousand miles away, is beyond me. That that they even think they have the moral right, nay, the moral obligation to do so, is why things will come to a head. People who sanctimoniously invoke “SLAVERY!” do so because they believe that is a knock out argument against the idea of “state’s rights.” I have already addressed why I think this fails, as far as principles go. (Eg, we all sleep well tonight, even with slavery alive and well.) But there is another problem with this line of argument, which views it only through the prism of the southern states. In actual point of fact, the northern states, though they found slavery to be intolerable, were tolerating southern slavery. The South’s mistake (beyond the obvious moral repugnance of justifying slavery) was not that it demanded to be left alone. No, that’s not what actually happened in history. No, the South DEMANDED that the North ALSO adopted pro-slavery positions. This is akin to what I said about how the world probably would have stood by, if Hitler had been content only to exterminate people in his own country. He got ‘greedy.’ Similarly, the South pushed through Federal legislation that compelled the North to accept the premise that people were property, eg, the Fugitive Slave laws. Such laws put the lie to the mythology that the South ‘just wanted to be left alone.’ These were Federal laws. And they pissed off a whole helluva lot of people in the North. Here we have another example where actually knowing history… I mean, really knowing it… provides important insight on how to advance and preserve the cause of freedom and liberty. (If you’re interested in that sort of thing, of course). People can put up with a lot of crap in the world, providing they are not forced to be a party to it. You can push and push and push, and people will bend. But there comes a point where you can push no further. One of the reasons the United States is in the bind it is in is because the Left is oblivious to any of that, and just keeps pushing. There are also cultural and institutional checks on the prospect of things ‘blowing up.’ Some of these have been alluded to already. In my next post, I will talk about what some of those are. We need to know what they are, because if these are the very things preventing violence and bloodshed from rolling across this country again, it would behoove us to protect and preserve those checks. No big surprise, here, but even these things are under attack in the US. And you know just which side of the political spectrum is leading the attack, don’t you.